Chief destroyer Trent Boult felt he was “in the groove” as his sublime six-wicket spell, backed by half-centuries from Tom Latham and Jeet Raval gave New Zealand a vice-like grip on the second Test against Sri Lanka in Christchurch on Thursday. At the close of the second day, New Zealand were 231 for two, holding a commanding 305-run lead in their second innings with eight wickets in hand. Sri Lanka’s hopes of taking the series-deciding Test were severely dented in a 15-ball masterclass of swing bowling from Boult when he took six wickets for four runs to give New Zealand a 74-run first innings advantage. “It is probably one of the best swing bowling grounds in the country. It was quite still out there and the ball was in good nick as well,” Boult said. “It is nice to get the ball moving around, making the most of it. “It’s all about rhythm for me anyway. I suppose getting into a groove, a couple of wickets gives you a bit of confidence and just lets you go about your thing. Sometimes you’re not really thinking about much and it’s kind of happening for you.” With the Sri Lanka innings in tatters, New Zealand took 74-run first-innings lead, which Latham and Raval extended to 195 with a century opening stand. Kane Williamson and Latham added a further 68 for the second wicket until Williamson played a lazy shot to Lahiru Kumara and was caught at first slip for 48. At the close of the second day, Latham was on 74 with Ross Taylor on 25. Latham received a life on 32 when he top-edged Suranga Lakmal to fine leg where the ball slipped through the fingers of a diving Dushmantha Chameera. Patel, who worked with Latham to produce the first wicketless session in the Test when they batted from lunch to tea, was out in the second over after the resumption for 74. Sri Lanka had resumed at 88 for four harbouring thoughts of overhauling New Zealand’s first innings 178. But nine overs and 16 runs later their last six wickets were gone, all taken by Boult, who finished with a career best six for 30. “Honestly, we are well behind in the game,” Sri Lanka batting coach Thiran Samaraweera said, but adding that they remained hopeful. “Anything can happen. The new ball is due after one over (on Friday). If we can get through a couple of wickets, keep them under 420, that’s a good thing.” Only Angelo Mathews was able to keep Boult out and he was unbeaten on 33 at the close of the innings. 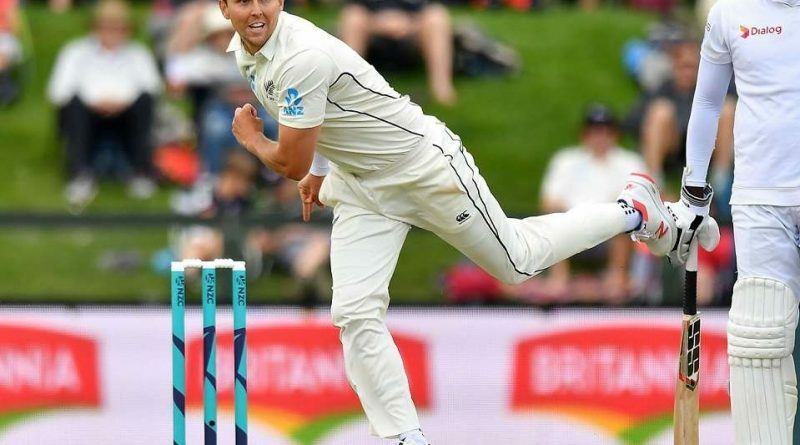 Boult triggered the collapse when he had Roshen Silva caught by Tim Southee at third slip for 21. A diving Southee produced a spectacular one-handed catch in Boult’s next over to remove Niroshan Dickwella for four. Dilruwan Perera, Suranga Lakmal, Chameera and Lahiru Kumara all misread Boult and went quickly leg before wicket without scoring to end the innings. Perera and Lakmal fell in consecutive deliveries with Chameera blocking the next ball to avoid a hat-trick before he was removed with the second ball he faced. Bowling: Boult 15-8-30-6, Southee 15-5-35-3, de Grandhomme 6-0-19-1, Wagner 5-0-10-0.